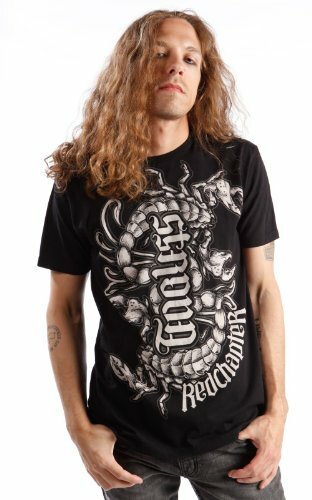 Mens Red Chapter Clothing Ambigram shirt in the Strong Fearless design in black. The tattoo art style reads as Strong in one direction and as Fearless in the other. This shirt is in Black and the art work features a Scorpion graphic. There is no foiling on this shirt making it perfect for guys that like ambigram shirts but do not want the shiny bling.